Past and present collide in a variety of cheerful colors and playful patterns, where the exciting, untamed wilderness meets the domestic tranquility of home sweet home. Welcome to the Heartland experience, a cozy respite within the rugged frontier. The regal whitetail buck and magnificent black bear dwell happily on shades of soothing greens and tans, accented with a fiery burst of red. 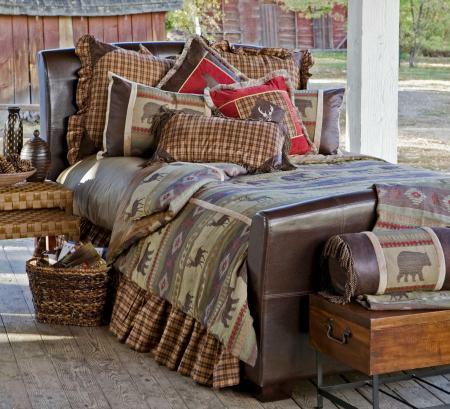 A warm plaid adds an element of whimsy to this collection sure to capture your heart! 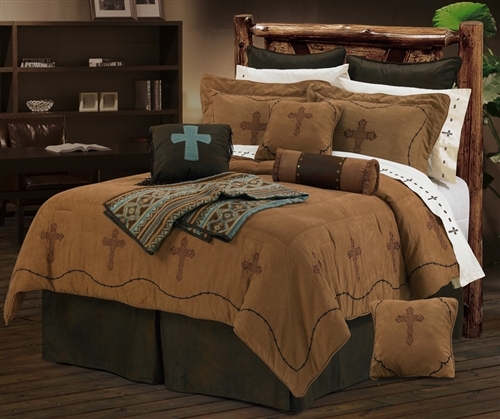 Comforter features buck and bear stripe design with red and tan chenille woven throughout fabric. This subtle weave includes shades of faded green, olive, brown and dark plum, with soft faux shearling fabric between seams. 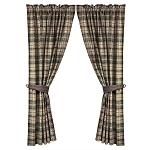 Gathered bedskirt, euroshams, and throw pillow in coordinating small tan plaid fabric with chocolate trim, ruffles and bullion fringe. Twin Comforter 67"x89", Bed skirt 39"x75"x15"
1 sham 20"x27", 1 pillow 14"x26"
Queen Comforter 92"x96", Bed skirt 60"x80"x15"
2 shams 20"x27", 1 pillow 14"x26"
King Comforter 110"x96", Bed skirt 76"x80"x15"
2 shams 20"x37", 1 pillow 14"x26"